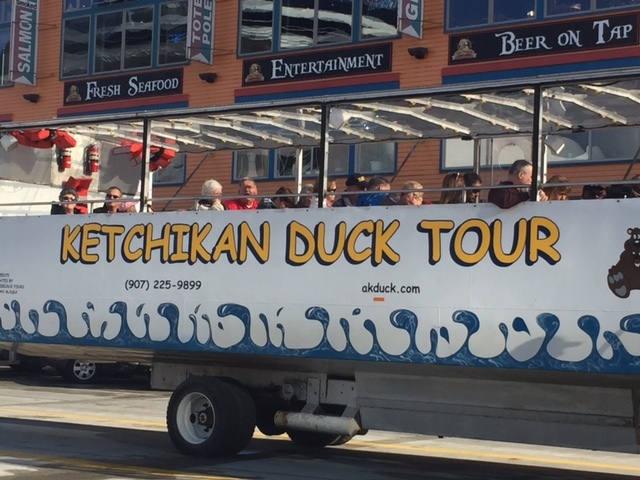 yesterday b and n took a tour on a duck ~ an amphibious car full of dozens of tourists, driving through ketchikan and then into the water. b said the jokes were endless from the tour guide: dumbest questions ever asked…..”what is the elevation of the cruise ships in ketchikan?” “how long does it take a deer to grow into a moose?” the guide said he answered, “seven years.” because a really dumb question deserves a really dumb answer. and she can’t explain herself unless she has a lot of time. and she is never, ever wrong. 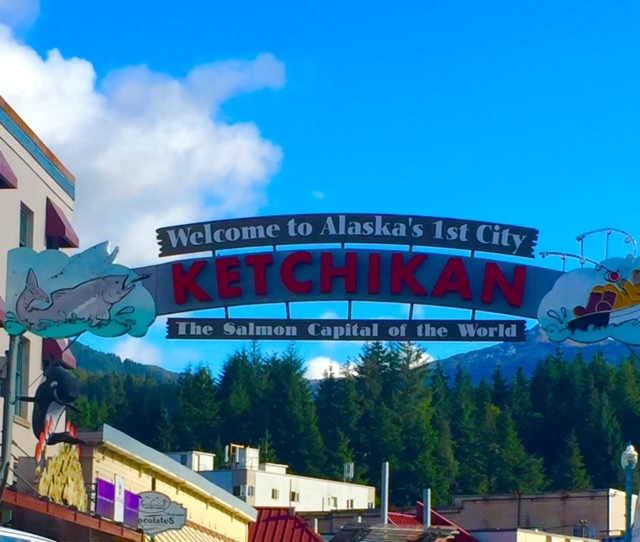 walking through ketchikan felt good, with fresh clear air and the freedom of open streets, once we got away from the hundreds of tourists, the three other cruise ships and the endless shops, full of 50% off everything you will never need. i learned again, that she defaults to shopping. i have shopped more int he last 9 months with her than i have in the last 9 years, maybe in my entire life. but i wondered yesterday if it is more than just the shopping; maybe it is a piece of her life that she has control over, that is familiar in some way. when we walked into a store i watched her eyes widen with the unfamiliar. uncertain where to go. i told her to turn right and go up the stairs. she snapped that someone told her where to go and she could get there by herself and that i didn’t need to boss her around. and she wouldn’t take a suggestion from me. once we got to the stairs, she stood there, overwhelmed in a new environment, but intent on getting a new waterproof jacket. and she just stood there. she told the sales person she wanted “base clothes”, tugging at her t-shirt, trying to tell the associate that only thin wool is the best. we were taken to a row of long underwear. mom got frustrated and tried to explain to the disinterested, irritated 17 year old what she wanted. i slipped the word “waterproof” into the conversation and we were able to get to the jacket department. the girl could really have care less , showed us one jacket and left mom confused about what she was looking for. she is easily distracted. it is difficult for her to stay on a single task. it is difficult to specifically communicate what she wants. it is difficult to plan ahead, to multi-task, to think in a bigger picture. H is their concierge. he is from germany and is at least six and 1/2 feet tall with a kind, soft manner and always dressed in a mourning suit with jacket, tie and striped slacks. yesterday i spoke with h alone; i told him about moms stroke, that i was here as her care giver and i could help make things go smoothly if we gave her two options and i had time to help her understand prior to his meeting with them. h has spent hours with my parents, listening and helping plan their itineraries, make dinner reservations and help keep mom out of the busy places on the ship. yes, that is what he is paid for, but working with mom is beyond a normal cruise director/concierge responsibility. 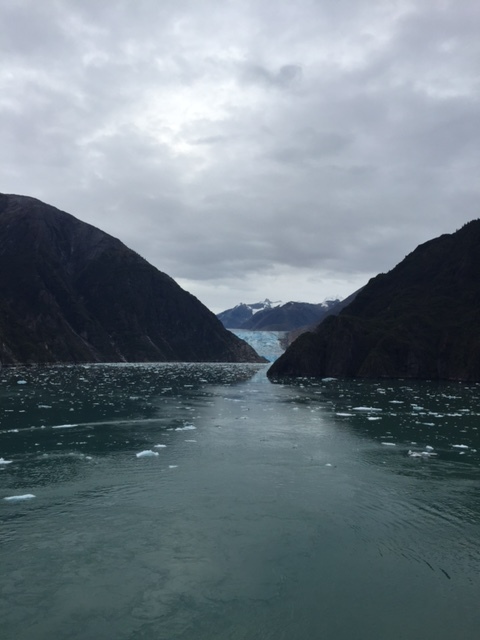 he was called to their stateroom at 830pm and to come as soon as possible. when he arrived he apologized for being a bit late, but he’d had an emergency dental appointment and was a bit groggy. my guess is he had been sleeping when he was beckoned. after we muddled through planning for the next days, mom asked about his appointment. he had a wisdom tooth extracted. and he was at work. attempting to smooth things out for my mother. n started to tell h about his 12 day tour of germany, france and england to view private care museums. once he was on a roll, he didn’t breathe. or pause. for a long time. he told h, in detail, what cars are like in germany. how they all work. oh, and by the way, he drives a porsche cheyenne and mom chirps in that it is her car and no one will let her drive and h attempted to say something and n over-talked and talked and talked. i don’t know why i was and continue to be stunned at his inability to recognize anyone else’s pain or discomfort or the lateness of the night ~ by then we were at 10pm ~ or the fact that no one in the room was listening to him pontificate, listening only to himself with little regard for anyone else. h sat there with his swollen cheek in his palm. it is tuesday, i think. we are waiting to float into mendenhal glacier. i woke in tears this morning. our morning chat began with talking about our cruise and someones upcoming surgery and what is she going to do, followed immediately by a conversation with an open checkbook, that covered writing a $30,000.00, no – $50,000.00, no – $10.00, no – $1,000.00 check because of all of the abused children in the world then moved on to why are they building apartments with someone that she will never speak to again. then she talked about how deeply someone in the family hates my father, her ex husband, based on events from 40 years ago because he was mean, and i’ve never really liked my brother. she asks again and again, what do i know about the building project. i told her that i don’t know anything. she heard, “i won’t talk with you about _______this.” the money, my childhood, my father, a building project, the surgery. that is when she called me snotty. i pull inward, try to keep the tears at a distance, telling myself that this is not an argument, this is not a conversation, this is not something that can be or ever will be resolved. we have talked with her neuropsychologist, Dr. M about clarifying misunderstandings and not carrying assumptions or preconceived ideas. i have made a commitment with her to “talk things out” and clear the air, to not walk away and pretend things are fine. IT IS JUST SO HARD and it takes so much time to find clarity. the stroke has fiddled with her brain and early dementia seems to be stirring the gray matter and the bruised heart that still longs to connect and love, but finds it so complicated, difficult and painful. in many ways, it would be easier to just ignore and move on, because she may not remember the conversation. and it is exhausting. she misunderstands. she starts to cry and says she does everything wrong. and we settle in to muddle through. 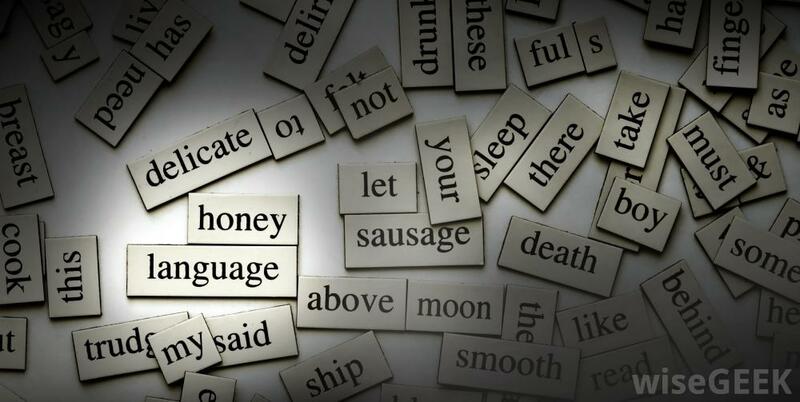 i remind her of the magnetic words that she used to have on her refrigerator. the ones that she could write poetry with. 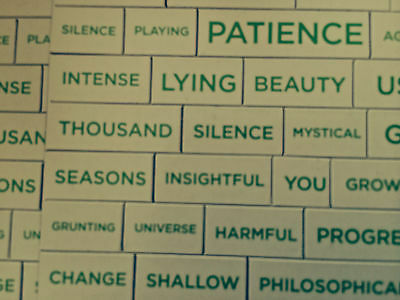 like those printed words, hers are separated in her brain and when she tries to say a sentence. the words come tumbling out like dice, rolling out of a plastic jar. what i hear or see is different than what she thought or meant and our task is to work together to get those words in the best order. we sat together. we found clarity, of sorts. we moved words around. for three hours. then we were done and she asked for a fried chicken sandwich and mango pineapple smoothie from mcdonalds.